In day to day life we have heard this word “E-commerce” but we don’t know the meaning of this word? In a simple word “E-commerce (Electronic commerce) is trading of buying and selling the product and service, or transmitting funds or data over the internet without any documents and forms which is completely through internet is considered as an Ecommerce. It covers different types of business, from consumer based retail site to different site, to business exchange trading goods and service between organizations. E-commerce is divided into three categories business to business (B2B), business to consumer (B2C) and consumer to consumer (C2C). Right now it is currently one of the most important aspects on internet. Ecommerce has completely changed the shopping habit of customer it has provided a new opportunity for business to reach customer from different parts of the world. The ecommerce facility too offers a service akin to the supermarket service but makes it even better. The virtual shops are open 24 hours a day and people can shop as and when they like. So let’s go for online with new E-commerce website or replace with existing one and exploring your business worldwide. In order to build new E-commerce website there are many E-Commerce platform are available to free of cost, so select any one like. It can handle multiple stores. 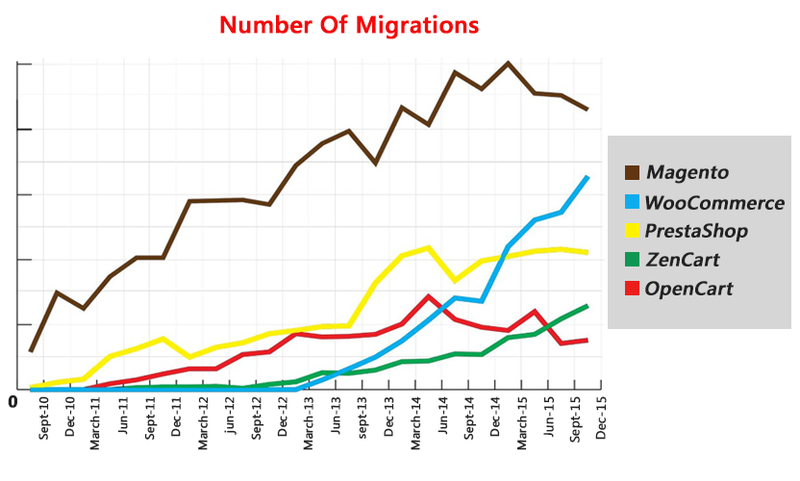 In Magento community large number of extension available in Market. One of the best advantages of Magento is that Magento is more Seo friendly compared to other platform. Magento is highly scalable no need to upgrade to another platform while in future. A best benefit of Magento is, it’s easy to integrate so that you can stay in touch with customer. One of the greatest benefits of Woocommerce is free to install. In Woocommerce users can easily figure out how to use it. One of the best things about WooCommerce is that it is regularly updated, so you do not have to worry about any security issues. You can start experimenting in theme. Prestashop is open source software available to start shopping cart. Prestashop is most user friendly open source which requires less technical skill to get started. Even non programmer can easily find out what require. Prestashop administration is flexible to use. Old theme can be easily replaced with new ones to keep the theme updated. The developers can modify as per client requirement. Zen Cart is a free e-commerce shopping cart so anyone can download it free of charge. Zen Cart is developed by real experts in the field of e-commerce as well as master programmers. Zen Cart is different because it is created with the needs and satisfaction of the users and their customers in mind. Zen focuses on consumer needs is the fact that it is easy to install and easy to set up. It just requires basic programming and basic skills. Open Cart quietly one of the best ecommerce platforms out there and is steadily growing. It is free open source and actively developed. Open Cart admin is easy to use. It is very fast to develop. It has lot of free modules and theme, cheap commercial modules. It has built in features like slideshow. It has good shop functionality, you can shop with 5 to 10 thousand of products can work on the cheap shared hosting. So as of feature magento is best for creating E-commerce website in comparison with some other platforms. It is best platform for E-commerce store. In Magento many extension and plug-in available which is easy to install to help Website owner to develop best Web store in comparison of other platform. Magento give more convenience and comforts to customer in shopping. 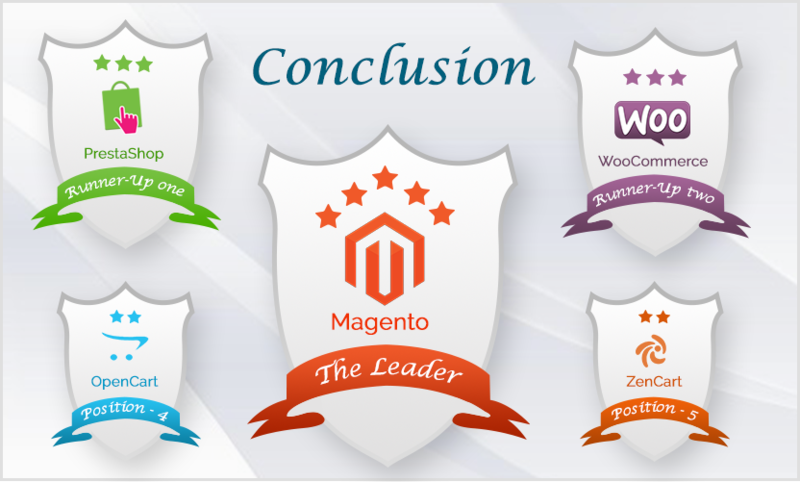 Magento always perform better. For many professionals as well as beginners taking as a first choice to create best E-commerce website. Compared to Magento, WooCommerce is a new on the block. WordPress need plenty of plug-in to install while in Magento large number of plug-in are available as well as thousands of theme available in Magento. WordPress use it own script and the script is not protected as well as other applications while Magento require either coding skills, access to a developer/team. Restriction on individual sites. WordPress is vulnerable for hackers as they know the system, lack of stability, WordPress websites of older version which won’t be updated. Compare to Prestashop, Magento has larger community. Magento has better support for seo in comparison of Prestashop. Magento has all the capabilities of MVC framework while Prestashop adopt smarty template engine based on Php. Scripts available in Prestashop can often out to be payable which is why worst considering in functionality. Large companies use Prestashop but they have to add different module to make more effective. Some modules have to be purchased as they do not come in solution pack. Performance and load time is not good. Both Magento and Zen cart are free and open source. Magento supports sales outlets in single interface while Zen Cart does not support. Magento support template management system for email while Zen cart does not have this feature. Magento supports many Seo features. Big disadvantages of Zen Cart are, it is not possible to use as ecommerce platform its design needs to be customization. Zen cart admin interface is a little messy in certain areas because there are so many contribution installed. In Zen cart only basic reports are available. Open Cart is an lightweight, have great features, be easy to extend and maintain, but it is not the most customizable piece of software out there while Magento is built to be an extremely configurable and customizable software. One of the biggest disadvantage of open cart is that open cart is miserable with diverse nation and does has good hook system. Open cart does not had excess of expert format which is difficult to customize. It is not in multilingual interpretations and if you want to change in code or format you must need an expert to do this. You can’t even add menu without edit open cart code. Open Cart is perfect for beginner and for those who want to run online store while Magento is better E-commerce solution. After the brief summary of Magento, now let’s see what Magento has to offer. Magento is open source platform which you can download free. Magento is one the top ecommerce platform for the internet distributor. Magento provides rich built in feature which provides flexibility, content and functionality so you can save money and time. Magento can also be updated by developer which means you get new features daily as well larger Magento community. Magento is php based platform whereas many other well known ecommerce platform are java based which assure that your development cost are lower. One of the key features Magento is SEO, SEO functionality is built in tag, description, site navigation and html. Integrated sales and store tracking. Infinite number of module can be add according to your need. Mobile friendly platform which allow user to access directly from multiple network. Run fast website with one backend system. Freedom to choose hosting service. Strong in term of security. TecStub has helped various retailers to implement successful Magento based online website. We provide Magento service from strategy to customizations. Our team brings in expertise on technology by understanding the client requirement. We analyze the client needs and target the customer to recommend .We recommend best Magento solution as per clients needs. We always try to build such a system which is in your budget and maximize your profit. With our comprehensive process and driven approach we deliver our service on time. Our technologies help us deliver highly profitable Magento based website to our clients. We have delivered ecommerce site which gives the maximum return of investment and meet the highest standard for business. We developed fully customize website which alignment the existing business objectives and process. We are team of passionate developers; our team has diversity in term of skill. We are one of the leading Magento solution providers IT company which help clients to move forward their business. We help our clients to achieve success.